I believe in an old adage - the devolution of responsibility to those who do the work. How many times does it happen that you are dealing with someone and need a decision and they have to refer the decision to somebody else? For me this happens far too often and simply illustrates a lack of training, a lack of trust in people, and people being over-managed and under-led. 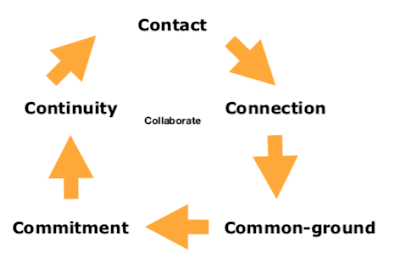 For all key transaction and interaction points (what Jan Carlzon once famously called moments of truth) of your product/service delivery path, the people at the coalface should be willing, able, and allowed to make decisions, period. 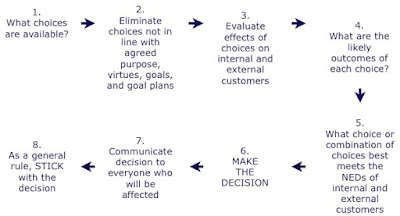 The following is a decision-making model I teach people to get them started on effective decision-making. 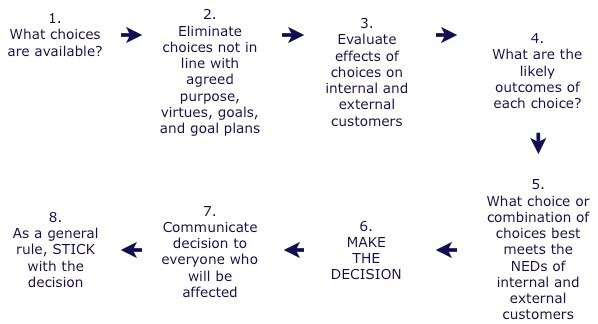 I am staggered at the number of organisations who don’t have a decision-making process and so I designed the following as a starting place. Usually wise people evolve it into something that works well for them. NB NEDs stands for Needs, Expectations, and Desires. In some quarters must haves, should haves, and nice-to-haves and in others demands, desires, and what is felt is deserved. Effective decision-making and making decisions where and when they matter, combined with giving memorable service, structures and systems that fully support people in bringing their best to their work on a consistent basis, being able to describe your strategy in six words, pursuing enlightened self-interest, turning values into virtues, and compelling stories without spin (see previous posts of June 13th, 11th, 9th, 7th, 4th, and 2nd) are 7 of what I believe are the 8 critical factors for success in modern business.